Joanna Kidney was born in Dublin, Ireland and currently lives in Co. Wicklow, Ireland. Her work utilizes the medium of drawing and the potential of diverse materials to reflect on the human experience and our relationship with the vast universe. It is influenced by an interest in interconnectivity between living matter and metaphysics. Engaging intuitively with a wide range of materials and methods, the work is an enquiry of contemporary drawing and its boundaries. Her 2 dimensional drawings perform as an act of thinking, remembering and mapping. These are expanded in her encaustic paintings, spatial drawings and assemblage works. Through this translation, interests are distilled, often arriving at a suggestive, poetic outcome. Solo Exhibitions include We are hurtling into the future, Galway Arts Centre, Galway, 2016; Wunderkammer, Mermaid Arts Centre, Wicklow, 2015; Dig, undig, redig, RHA Atrium Gallery, Dublin, 2013; Sing yourself to where the singing comes from, The Drawing Project, Co. Dublin, 2011; This speaking place, Stone Gallery, Dublin, 2006; New Work, Fenderesky Gallery, Belfast, 2005; In and out of a familiar world, Linenhall Arts Centre, Co. Mayo, 2003; The shape of a moment, Triskel Arts Centre, Cork, 2003. Selected Group Exhibtions include Eigse Carlow Arts Festival; RHA Annual Exhibition, RHA, Dublin; Boyle Arts Festival; Contemporary Art from Ireland, European Central Bank, Germany, Metamorphosis in White, Gallerie HD Nick, France; Les Quatre Saisons de l’Art, Gallerie HD Nick, France; Shortlisted entries for First National Solo Exhibition Award (three person show with Sinead Fox and Niall Martin), Sligo Art Gallery and Works on Paper (three person show with Gerard Cox and Jane Proctor), Ashford Gallery, RHA, Dublin. She is a founding member of Outpost Studios, Bray, Co. Wicklow (2014); a member of the artists collective The Tellurometer Project (with Helen G. Blake, Joanne Boyle, Raine Hozier Byrne, Rachel Fallon, Laura Kelly and Susan Montgomery) and a featured artist on The Drawing Suite. Residencies include Artist in Residence, Brigham Young University, Utah; Ballinglen Arts Foundation, Co Mayo; The LFTT Library @ The Guesthouse, Cork with The Tellurometer Project; Hexagon, a residential collaborative printmaking project in Cork Printmakers, Cork; Cill Rialaig, Co. Kerry; the Tyrone Guthrie Centre, Co. Monaghan and Heinrich Boll, Co. Mayo. Awards include an RHA Studio Award; Ballinglen Arts Foundation Fellowship; Runner-up Award, Open Exhibition, Mermaid Arts Centre (selected by Patrick Murphy, Director RHA, Dublin) and a DIT Award of Excellence. She is the recipient of several Wicklow County Council individual and group bursaries. Her work is included in the collections of AIB, The Central Bank, Dublin, OPW, UCD and the Department of the Environment, Northern Ireland. Joanna Kidney has been a guest on 2 episodes. 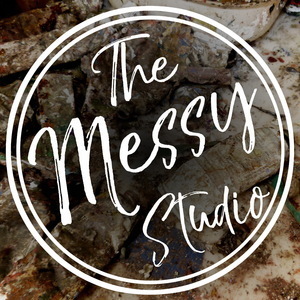 Rebecca takes the Messy Studio Podcast to Ireland where she conducts an interview with Joanna Kidney. This episode was recorded in October, 2017.